The size and shape of playpen is adjustable by adding or removing panels or by placing panel in different shape. It also may create interest and encourage mobility for your child. Makes a great holiday gift. The use of professional colour design makes the yard eye-catching and gives children a sense of protection while they are playing. The height of the fence is long enough for the baby to stand and walk while the area inside the yard is plentiful for them to explore around. Perfect for baby and children up to 4 years of age. Assembled Dimension: When 8 panels assembled diameter 74 inches. Individual Panels: 28" W x 23" H.
Adult need to stay with baby full time when use this product, do not left baby alone in this product, make sure baby do not eat the sticker and the floor sucker and other removable part. ✔It is a great amount of space for baby to learn walk and even laying with baby in it for play time. 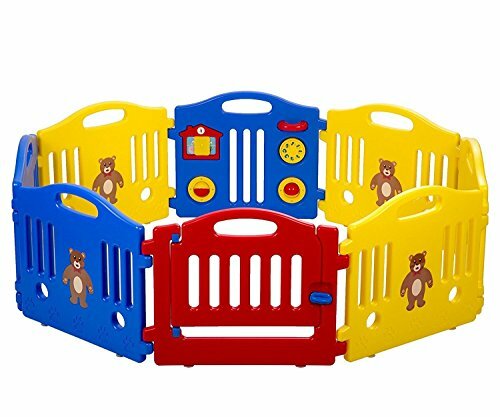 ✔8 Panels for the Flexibility of Construction- With 8 panels included, you can adjust this playpen into different shapes such as octagon, rectangle, square to fit your space. A great convenience to you!